Background: A neuroprotective effect of nimodipine on acute cerebral infarction has been confirmed, but there are few reports regarding the therapeutic effect of nimodipine on acute massive cerebral infarction. There is also no consensus on the optimal time window for the use and dosage of nimodipine. This trial is planned to answer these questions using a double-blind randomized controlled design. Methods/Design: This is a double-blind randomized controlled trial. The experiments will be conducted in the Department of Neurology, Central Hospital Affiliated to Shenyang Medical College of China. One hundred patients with acute massive cerebral infarction will be randomly assigned to a control group and a treatment group. 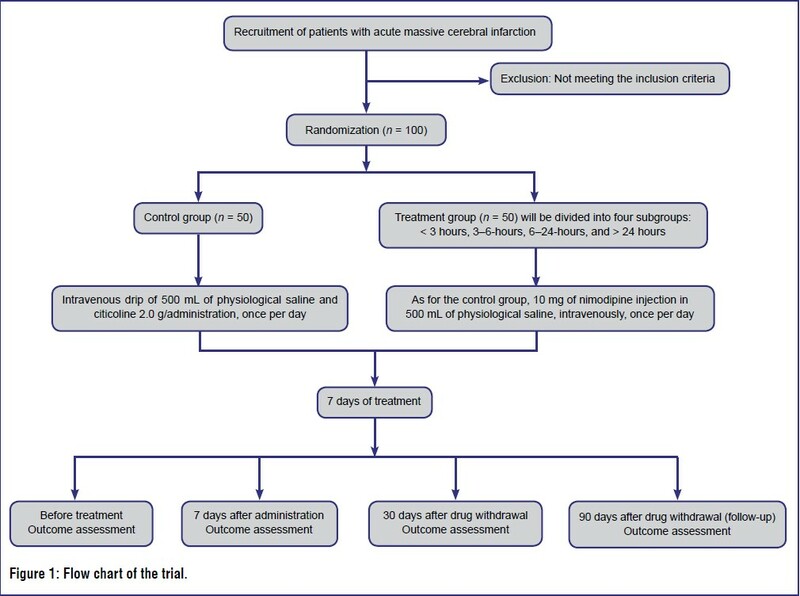 Patients in the control and treatment groups will receive intravenous infusion of citicoline and intravenous infusion of nimodipine (10 mg/d) respectively, for 7 consecutive days. Simultaneously, to determine the appropriate time window for treatment with nimodipine, patients in the treatment group will be divided into four subgroups according to the time of nimodipine administration: < 3 hours, 3-6 hours, 6-24 hours, and > 24 hours. The main outcome measures are: the National Institutes of Health Stroke Scale and the Rankin scale will be used to assess the severity and recovery of neurological impairment, respectively. Cranial computed tomography and magnetic resonance imaging will be used to evaluate brain lesions and the Barthel index will be used to assess the activities of daily living. Secondary outcome measures are heart rate and blood pressure. Discussion: It is hoped that the experimental results can determine the best application time window and dosage of nimodipine for acute massive cerebral infarction. Trial registration: ClinicalTrials.gov identifier: NCT02248233; registered on 22 September 2014. Background: Cerebral hemorrhage is often complicated by conscious disturbance and restlessness regardless of the size or location of the hemorrhage, and sedation is often necessary. Dexmedetomidine has dose-dependent sedative, anxiolytic and analgesic effects. It is suited to patients undergoing mechanical ventilation for traumatic brain injury; however, its sedative effects cannot easily be controlled in patients breathing spontaneously. We will investigate the safety and efficacy of postoperative intranasal dexmedetomidine in patients undergoing craniotomy for hypertensive cerebral hemorrhage. Methods/Design: A randomized parallel-cohort controlled trial will be performed at the South District of Anhui Provincial Hospital, China. Patients with hypertensive cerebral hemorrhage will be randomly divided into groups treated with 0.9% normal saline (placebo), or dexmedetomidine 1 or 1.5 μg/kg. Study drug, either undiluted dexmedetomidine 1 or 1.5 μg/kg (dexmedetomidine group) or equal volume of 0.9% normal saline (placebo group), will be administered immediately to each naris as drops after craniotomy for evacuation of hematoma. Primary outcomes include systolic blood pressure, diastolic blood pressure, heart rate, peripheral oxygen saturation, intracranial pressure, Glasgow Coma Scale score, the level of inflammatory markers in the cerebrospinal fluid, and the levels of malondialdehyde, superoxide dismutase, 4-hydroxynonenal, neurotensin, 8-hydroxy-2'-deoxyguanosine and corticosteroid in serum. Secondary outcomes are volume of hematoma, body weight, duration of surgery, duration of anesthesia, blood loss, urine output and length of hospital stay. 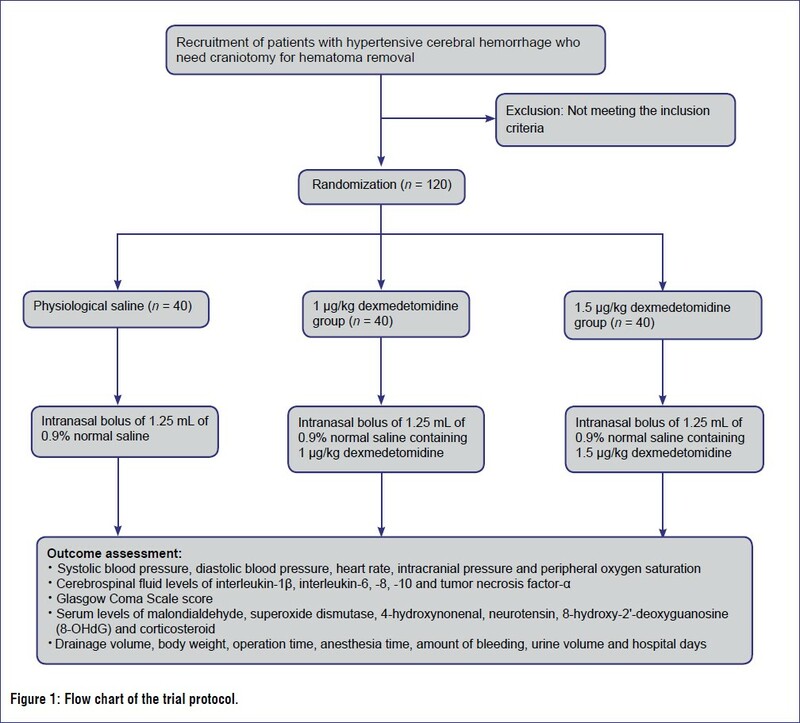 Discussion: The results of this trial will provide evidence for the safe and effective postoperative use of intranasal dexmedetomidine in patients with hypertensive cerebral hemorrhage who are not mechanically ventilated. Trial registration: Chinese Clinical Trial Registry (http://www.chictr.org.cn/index.aspx) identifier: ChiCTR-IPR-15006668; registered on 30 June 2015. Ethical issues: The trial was approved by Clinical Research Ethics Committee of Anhui Provincial Hospital, China (permission No. 2015 ethics No. 07). Background: Hyperglycemia after traumatic brain injury is a physiological and metabolic disorder that may further aggravate secondary injury to the brain. Various experiences in the effective treatment of hyperglycemia after traumatic brain injury have been described. For example, the early use of intensive insulin therapy can control the blood glucose concentration within the target range, which has a direct protective effect on severe traumatic brain injury. However, some studies have arrived at different conclusions. Therefore, we aim to verify the therapeutic efficacy of intensive insulin therapy versus nonintensive insulin therapy on hyperglycemia after severe traumatic brain injury. Methods/Design: A randomized, controlled, double-blind study has been designed for completion at Oriental Hospital of Lianyungang, China. 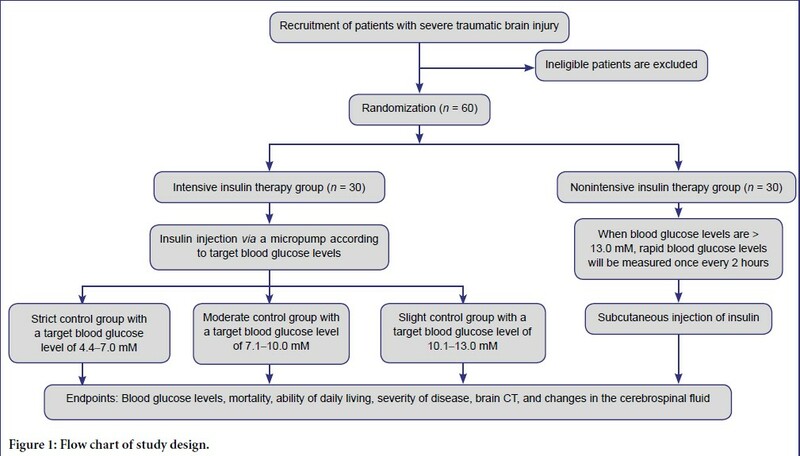 Sixty patients with hyperglycemia after severe closed traumatic brain injury will be randomized into an intensive insulin therapy group and a nonintensive insulin therapy group. The intensive insulin therapy group will then be divided into three subgroups based on the following target blood glucose levels: 4.4-7.0 mM (strict control group), 7.1-10.0 mM (moderate control group), and 10.1- 3.0 mM (slight control group). In the intensive insulin therapy group, the blood glucose levels will be monitored and controlled using the Yale Insulin Infusion Protocol, and a micropump will be used for intravenous injection of insulin. The nonintensive insulin therapy group will be given subcutaneous insulin injections. The primary endpoint will be the blood glucose levels, and the secondary endpoints will be mortality, activities of daily living, and prognosis. Discussion: This study will be powered to confirm the advantages of intensive insulin therapy in controlling blood glucose levels, reducing mortality, and improving prognosis in patients with hyperglycemia after severe traumatic brain injury. Trial registration: ClinicalTrials.gov identifier: NCT02161055; registered on 5 June 2014. Background: Favorable quality of recovery from general anesthesia in neurosurgical patients is an important goal for anesthesiologists. Dexmedetomidine is an emerging anesthetic adjuvant characterized by a stable hemodynamic recovery period, and neither its sedative nor analgesic effects influence evaluation of neurological function. 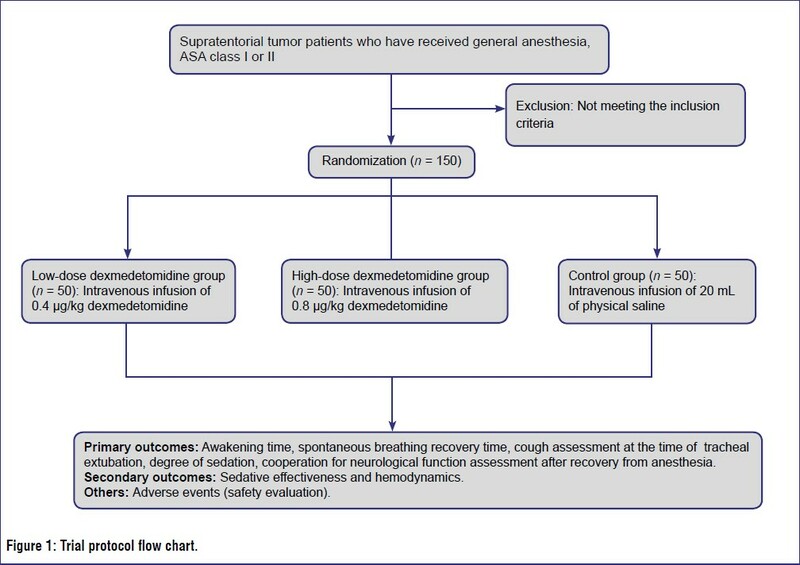 We hypothesize that a bolus injection of low-dose dexmedetomidine during general anesthesia within minutes before the end of surgery in patients undergoing craniotomy can improve the quality of recovery from general anesthesia, thereby benefitting the evaluation of early-stage neurological function after surgery. Methods/Design: Patients with supratentorial tumors who have undergone craniotomy under general anesthesia at the Department of Neurosurgery, First Affiliated Hospital of China Medical University are included in this randomized controlled trial. A sample size of 150 patients is needed. Patients in the experimental group are randomly assigned to receive intravenous bolus injection of low- and medium-dose dexmedetomidine (0.4 and 0.8 ΅g/kg, respectively). Patients in the control group receive equal doses of physiological saline. The primary outcome of the study is the quality of recovery from general anesthesia, including awakening time, degree of sedation, spontaneous breathing recovery time, and coughing and bucking at the time of tracheal extubation. Secondary outcomes include postoperative analgesic effects, hemodynamic indices, anesthesia time, operation time, and neurological function assessment. Discussion: The results from this trial will provide optimal evidence for intravenous bolus injections of dexmedetomidine at a dose that can improve the quality of recovery from general anesthesia after craniotomy for supratentorial tumors. Trial registration: ClinicalTrails.gov identifier: NCT02007798; registered on 6 December 2013. Background: Ultra-low frequency transcranial magnetic stimulation is a novel transcranial magnetic stimulation method that was developed based on the biological resonance principle and has been used in combination with an encephalofluctuograph. It can be used to treat brain diseases by regulating the brain electrical activity of various neurotransmitters, thereby overcoming the shortcomings of conventional transcranial magnetic stimulation. Nevertheless, stimulation intensity, frequency, protocol, and curative effects should be considered. Ultra-low frequency transcranial magnetic stimulation has been widely used to treat insomnia and several studies have reported on the use of ultra-low frequency transcranial magnetic stimulation for the treatment of cerebral palsy. Methods/Methods: This is a randomized, parallel-cohort controlled trial. Patients with spastic cerebral palsy, aged 2-4 years, are included in this trial and assigned to two groups. In the control group, conventional rehabilitative treatment methods, including exercise therapy, Chinese traditional manipulation, and muscle fiber excitation are used. In the treatment group, in addition to routine rehabilitative treatment methods, ultra-low frequency transcranial magnetic stimulation is used. After 1 and 3 months of treatment, the outcomes are evaluated. The primary outcomes of the trial include Gross Motor Function Measure (GMFM) scores, Fine Motor Function Measure (FMFM) scores, and Wechsler Intelligence Scale for Children (WISC) scores. 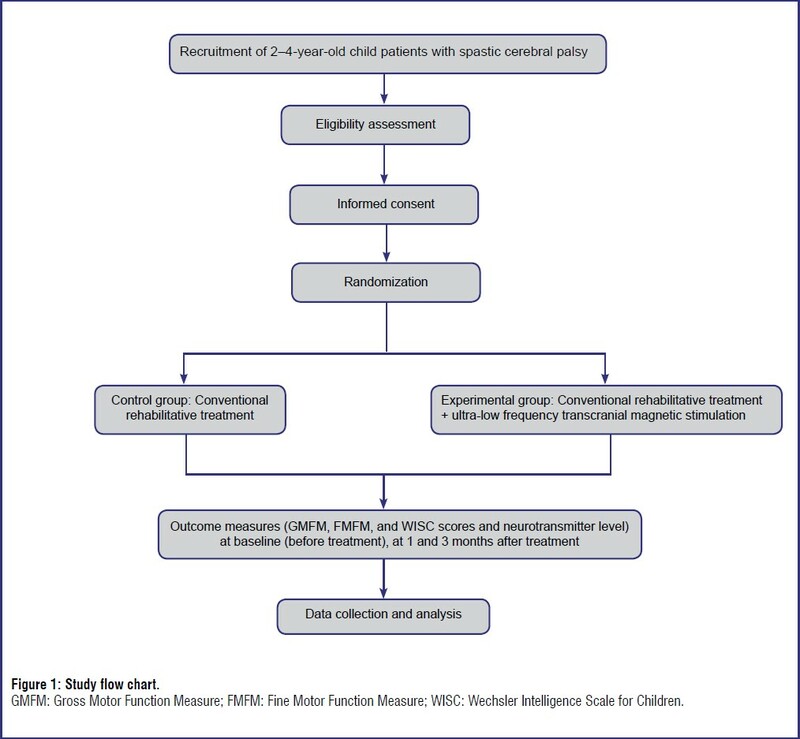 Discussion: The trial will provide clinical scale data for the use of ultra-low frequency transcranial magnetic stimulation to improve motor function and intelligence in child patients with spastic cerebral palsy. Trial registration: Chinese Clinical Trial Registration identifier: ChiCTR-TRC-14004706; registered on 26 May 2014. Ethical issues: This trial was approved by the Medical Ethics Committee, First Hospital, Jilin University, China (approval No. 100818-062). Signed written informed consent will be obtained from each subject. Background: Vitamin D plays a unique role in promoting embryonic and neural development, cerebral immunological regulation, and influencing neural differentiation and gene regulation. Vitamin D deficiency may be one of the environmental risk factors for autism spectrum disorder. This trial has two purposes: (1) correlating single nucleotide polymorphisms of vitamin D metabolism-related key enzymes to autism susceptibility; and (2) investigating the therapeutic effect of exogenous vitamin D on autism spectrum disorder. Methods/Design: A non-randomized parallel-cohort controlled trial. Sixty children with autism spectrum disorder who receive treatment at the Department of Pediatric Neurological Rehabilitation, First Hospital, Jilin University, China, are included. Sixty healthy controls are also recruited from those undergoing a physical examination. For the first purpose, primary outcomes include vitamin D metabolism and single nucleotide polymorphisms of related genes. Vitamin D level in peripheral blood is the secondary outcome. For the second purpose, 60 children with autism spectrum disorder are treated with exogenous vitamin D supplementation. Prior to and 1 month after exogenous vitamin D supplementation, primary outcomes are evaluated, including the Childhood Autism Rating Scale (CARS) score, Autism Behavior Checklist (ABC) score, the Gesell Developmental Schedules (GDS) score, Clinical Global Impression Scale-(CGI) for severity of illness (SI), global improvement (GI), and efficacy index (EI) scores. Again, vitamin D levels in peripheral blood are evaluated as the secondary outcome. Discussion: This trial is sufficiently powered to provide scientific evidence for the genetic and pathological mechanism of autism spectrum disorder in children that lack vitamin D. Trial registration: Chinese Clinical Trial Registry (http://www.chictr.org.cn/index.aspx) identifier: ChiCTR-TRC-14004499; registered on 30 November 2013. Ethical issues: This trial was approved by the Medical Ethics Committee, First Hospital of Jilin University, China (approval No. 2013-192). The trial protocol will be performed in accordance with the Declaration of Helsinki.